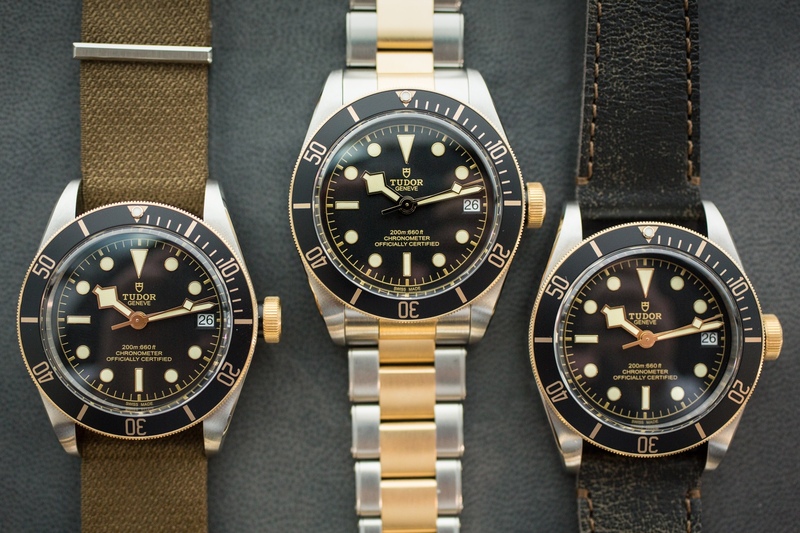 Now, if you’ve watched my review of the Tudor S&G you’ll know that I’m #team2tone all the way, but the thing is, I don’t *really* know how to wear it. I mean, I think I’d be OK in more formal settings — just pair it with a suit and away you go, but in every other part of my life — not so sure. I’ve got two-tone anxiety, and I’m sure I’m not the only one. Because, much as we’re all aware that the mix of precious and plain metals is, once again, en vogue, our awareness of it, and how to wear it, is still stuck in the 1980s. So I thought it was time to bring in the big guns, in the form of David Meagher. David, aside from being editor of The Australian’s WISH magazine, is a bastion of good taste and a sartorial safe harbour. He’s also of a vintage to have experienced the two-tone trend last time it was cool, so he’s in a unique position to tell us how it was done and how it should be done. Now David, I don’t think it’s too forward of me to suggest that you might have experienced the glory of two-tone the first time around. For me, it’s something I associate with Wall Street, American Psycho and the era of excess. What was it really like? I remember the period fondly, mainly because I had hair back then and took great pride in styling it like Michael Douglas in the film Wall Street. I was a student, so I had no real need to wear a suit and tie during the day but I aspired to do so one day. I think it’s fair to say many men of my generation did. Even if we didn’t really know what a Wall Street banker did, we wanted to look the part – that meant a mobile phone the size of a house brick and the other accessories to go with it: watch, ties, two-tone collared shirt et cetera. How did you feel about two-tone in the ’80s? Do you own some low-key bling, or aspire to it? I still have some of my ties from that era — I never throw ties away — although it’s hard to wear them as they were kind of wide and kind of ugly (think paisley). I was quite fond of a gold tie pin in those days but for some reason I hate them today – I feel like if your tie wants to flap about in the breeze then you should let it. I’ve never really been one for over accessorising, but if there is one thing from that era that I would give my right arm for it’s the watches – I think you have to be over a certain age to wear a gold watch and I think I have reached that age now. And how was two-tone worn back then? Was it all Oxford stripes and suspenders? Sometimes it seems like not that much has changed when it comes to male fashion – especially in the banking and finance world. I once worked for a company where everyone wore a white shirt and to turn up in anything else was considered radical. I’ve always felt that the two-tone collared shirt (where the body of the shirt is one colour and the collar is white) is an item of clothing that can really only be pulled off by someone in authority – it’s for C-Suite executives rather than aspiring mail room boys. Everything was bolder back then – the stripes on shirts and suits were thicker, shoulders were bigger, ties were wider and didn’t have a lot of subtlety to them. It was all about an outward display of success and wealth – today, the richest guy in the room is probably going to be the one in a T-shirt and baseball cap. It’s taken some time but it looks like two-tone, even in yellow gold is back with a vengeance. What’s the same, and what’s different this time ’round? The biggest difference now is it’s just a bit more subtle, even if it is in yellow gold. 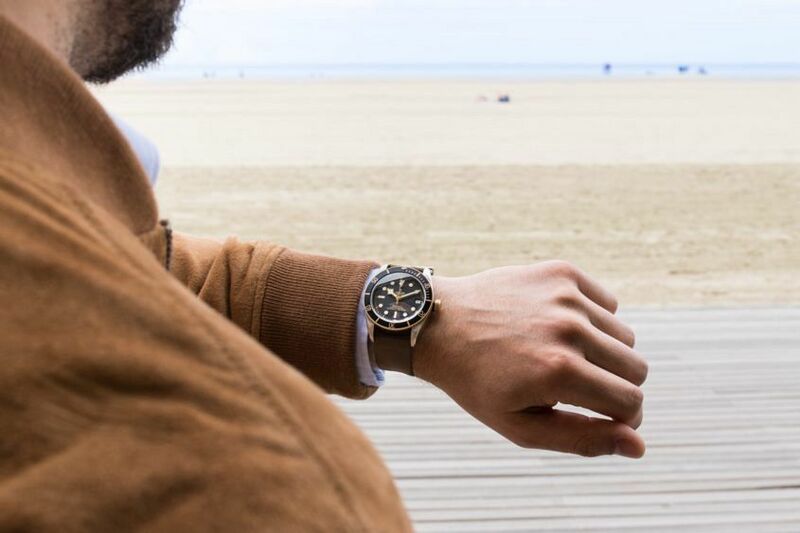 Men are generally dressing in a more casual way and that means how they wear a watch has changed as well. Once it might have been considered essential to make sure all your jewellery items (cufflinks, tie clip, wedding band et cetera) matched. These days, most men don’t dress that formally and if they do they’re a little more relaxed about it. David Beckham is a good benchmark for how to wear a two-tone watch, even in yellow gold – just do it, wear it with jeans and a T-shirt if you want to. Any other tips on two-tone done right? Oxford stripes and suspenders still OK? A lot of people seem to have a particularly bad hangover when it comes to two-tone, where do you stand on it? One of the great things about men dressing more casually, even in the workplace, is that it makes dressing formally much more fun. It also helps to differentiate your work and home time if you dress up more for work. Men are starting to wear suits again, but the way they’re doing it is different to the 1980s. Where it was all big shoulders and pinstripes in the ’80s, today it’s more likely to be about solid colours in lighter fabrics and with deconstructed shoulders. That doesn’t mean you can’t go the full two-tone if you want to. A light blue shirt with a white collar can look incredible if it’s done well – the key is to not go overboard. Choose a lighter shade of blue and wear it with a solid coloured or textured tie. If you wear suspenders – and some men do prefer them – then don’t wear a belt. Similarly, if you wear a waistcoat you don’t need to wear a tie pin. It’s all about attitude and how you carry yourself as to whether you can pull off the two-tone look. The look says you mean business, so you need to feel confident wearing it. 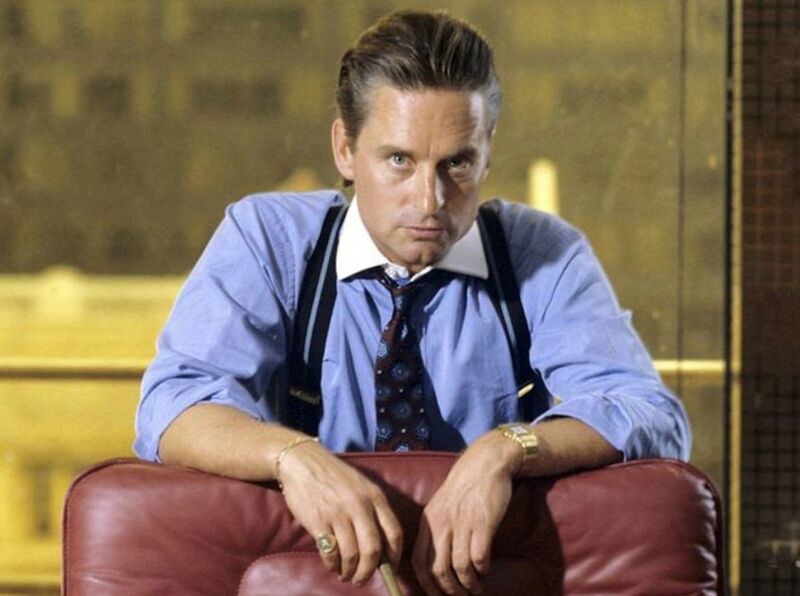 If you’re lucky enough to have hair then I’d just go with a neat style – leave the full Michael Douglas back in the 1980s.